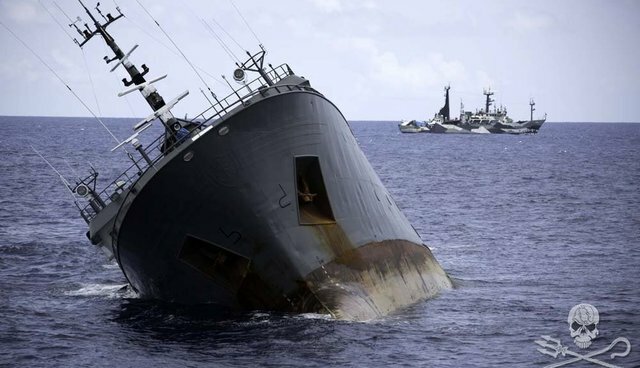 Captain Peter Hammarstedt of the Sea Shepherd anti-poaching ship Bob Barker has reported that the unflagged toothfish-poaching vessel Thunder has sunk. The ship went down in 4,000 meters of water in the position of 00 Degrees 19' North & 005 Degrees 25' East. This is 19 nautical miles north of the Equator and 115 miles from Sao Tome. The film crews onboard the Bob Barker and onboard the Sam Simon filmed the Thunder as it slid beneath the waters of the Atlantic Ocean inside the exclusive economic zone (EEZ) of the nation of Sao Tome. The evidence is that the Thunder was deliberately scuttled by her captain to destroy the evidence of their illegal fishing operations in the Southern Ocean. The 40 crew of the Thunder are presently onboard the Sea Shepherd vessel Sam Simon and under observation as Sea Shepherd awaits a response for assistance from Nigeria or Sao Tome. "Usually when a vessel is sinking, the captain will close all hatches so as to maintain buoyancy. However, on the Thunder, the reverse was done - doors and hatches were tied open and the fishhold was opened. It is an incredibly suspicious situation, to say the least," said Captain Peter Hammarstedt. The pursuit of the Thunder has ended after 110 days with the Thunder sunk and no injuries to the crews on any of the vessels.